Someone asked me this question at the bus stop the other day. I’m not surprised it came up because the ubiquitous city birds – house sparrows – are champions of dust baths. They’re the ones who prompted the question. House sparrows prefer very fine dust and will flap up a storm when they find a patch of it. They dig a hollow with their feet, push their bellies into the dust and toss it under their wings and over their backs as if it was water. Their goal is to get the dust into their feathers and all the way down to their skin. When they’re suitably coated they shake off the dust and preen it away until their feathers are in good condition again. Why go to this trouble? Dust smothers skin and feather parasites and absorbs excess oil that’s removed as the dust is preened away. Did you know you can clean your hair using powder? It’s the same idea. House sparrows take dust baths even when water is available. 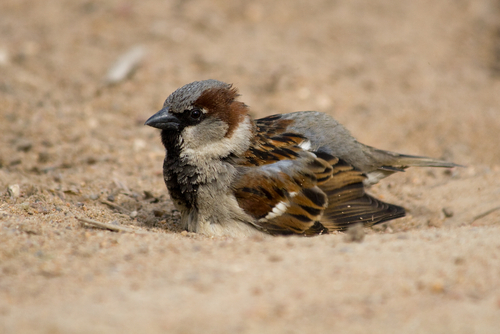 Maybe the first house sparrow came from a desert climate. After all, their Paleolithic fossils have been found in Ouum-Qatafa Cave in Israel. If they can clean with dust and save water for drinking, why not? This summer we’ve had so much rain the house sparrows must be hard pressed to find any dry dirt. They might have to use my bird bath after all. Thanks for this explanation! I’ve never seen the sparrows do this before until today. The past couple of days I have been weeding my long-neglected yard. This afternoon, I came home after running an errand to find six sparrows enjoying dirt baths, each small bird sitting in its own little depression of soil once inhabited by a weed. The birds vigorously flapped their wings and kicked up quite a dust cloud, chirping in joy as they did so. A seventh bird flew in to join the group, but tried to oust one of the bathers out of its bath. The two birds scuffled for a while, with wings beating frantically amidst loud chirping. The interloper was rebuffed, and found a dirt depression of its own. Peace was restored and the joyous bathing resumed. I was standing at my kitchen sink today washing dishes and noticed a lone sparrow seemingly digging a depression into some loose soil under a small magnolia tree by my patio. There were other sparrows around but, this little guy was taking the lead with his task. Then I watched him flapping about in the depression he made and kicking up the dust. I had never seen that before until today! So naturally I had to google to find out what and why he was doing that. Thank you for your explanation. I’ve noticed that the other sparrows are following suit now as well. It makes for something interesting to look at whilst I do the dishes. Thanks! I am glad that I found this site which gives me an explanation as it has been worrying me as sparrows are doing this and messing up my lawn. I developed some bad patches in the lawn and the grass does not come back as the sparrows continuously make their holes and borrow in so that only their head sticks out. They shake themselves around vigorously and create their own little dust bowl. It is quite cute and I appreciate now why they do it. I thought they were attracted to insects in the ground. Now I just have to find a way of keep the sparrows and my lawn! I, too, saw some sparrows outside my window at work digging and tossing the dry, powdery dirt onto themselves today. It was cute and fun to see. They seemed to be having a great time. I look out this window every day and have been for years, but this was a first for me. Thanks for the great explanation! Same as the others, I did a quick Google search for an explanation of the behavior. I was watching a variety of birds enjoying the bird bath and bird food in the backyard when I heard several birds near my front door – I looked out and observed sparrows bouncing around in a landscaping area. They were chasing each other around and then several started burrowing into the dirt/mulch and tossing it over themselves. They also pecked at it so I thought they were searching for ants/insects but now I know it’s a dirt bath! Thank you for the explanation! Thanks for the info. Im sitting here in my carwatching birds and thr sparrows are taking dust baths. I always wonderef about this. Just as I thought! I knew the birds did that to get rid of something that’s crawling around in their feathers. Growing up in Queens NY, I witnessed the same thing with the little sparrows. At first I thought they were marking their territory to get girlfriends/boyfriends. Now I have chickens (I now live in Washington state) and they do the same thing. It’s really fun to watch them do that. At least for me. Like everybody else here, I saw this the other day in the dust under an urban tree and got here by Google. There were four birds sitting in wells in the dust, flapping around–never saw that before! Amazing little birds, these sparrows. I enjoyed watching their dirt baths yesterday. I guess all God’s creatures are amazing when you think about it! Thanks for the explanation, I had noticed when I went into the garden to continue clearing that there were dips in the dry soil. I have just finished clearing the rest of the front garden of weeds and long grass, I now only have bushes which have been cut back, I looked out the window to admire my work and low and behold I had a flock of birds having a dust bath, thinking they might need a drink I cut a large juice bottle length ways to make a bath they just loved it I was going to put bark down but I think I will leave a space for the birds to bathe.I think my grandson will enjoy watching them when he comes to visit. I did wonder why the birds went through this ritual, I have now been enlightened, many thanks. I have a rather large House Sparrow community in my backyard. They can be a pain sometimes but I do enjoy watching them take dust baths. Years ago I set up a squared enclosure specifically for dust bathing. I thoroughly raked the dirt clean of rocks, sticks and other riffraff and hollowed out eight grooves for the Sparrows to bathe in. Every couple years I gather as much of the loose dirt/dust as I can and filter it through an old sifter to make the dust even finer. A deluxe 8-bath dust bath. I was just watching about twenty or so Sparrows enjoying the baths and kicking up a massive dust cloud in the process. Sometimes the rabbits will roll in it too. Make one for your yard. You’ll enjoy it! Thank you for the explanation on why they bathe in the dust. Amber, perhaps something outside the window frightened him — or something else is wrong which I can’t diagnose over the Internet. If this persists I suggest you take him to a rehabber. I hope he is a house sparrow. If he is any other kind of bird it is illegal to keep him without a permit. Amber, I guess you’ll have to observe carefully and watch to see what triggers his reaction. The other birds might give a clue — parrots make lots of noise when they see danger. The other day after returning from the grocery store and turning my car off, I looked up to notice at the end of a neighbors driveway the cutest scene of about six little sparrows taking a dust bath! I have never seen that before or that they even did that. I sat there for a few minutes and watched while I giggled to myself at their sweet animated way of digging, dusting, fluttering, and rolling. And like a fellow blogger, I noticed that when a little stranger would enter the group, they would not be so sure if he would be welcomed. After all there was a lot of work making that little area, his or her own. The world’s little creatures are so innocent and so cute! I enjoyed all the info. and I love birds but the sparrows at my house have destroyed the grass just off my porch and it looks awful. What can I do to stop them? I think they only do it in the AM early but they are ruining my landscaping. Please help. Mary farmer, the answer depends on where you live? What state do you live in? I have been watching the sparrows around my feeder make little concave holes in the ground and then flap their wings like they were in water. I decided to “google” this and immediately found your posting. Great information, thanks so much! Not sure why any creature would want a dirt bath, but to each their own! Learned something anyway. I just looked out my kitchen window and saw about 8 or 9 birds dust bathing. I had never seen birds do that before. I’m so glad I found your website to find out why. Thank you! Seen this for two days now I thought I was going crazy. The sparrows are making too many indents on my lawn. I do not have grass but other plants and every time I plant anything they get dug up by this bathing on my lawn. What can I put down around my plants to deter them doing this? Juli, perhaps they would stop if you placed pebbles there instead. I wonder if bald eages take dust baths?